I embraced minimalism in 2014 and haven’t looked back. Let’s talk about what I’ve learned from living out of a suitcase. Everything that I own fits into a big suitcase and a carry-on. I love the flexibility that living out of a suitcase and backpack gives me. Since leaving Vienna I’ve lived in London and two times in New York City! It’s been wonderful yet challenging and I wouldn’t have it any other way. Everything that I own fits into this suitcase and backpack! Prior to moving out and leaving Austria at age 22, I needed to let go of a whole bunch of paper. Greeting cards, birthday cards, school work, certificates, you get the idea. I ended up recycling most of it, took photos of important documents and threw away anything that couldn’t be recycled. I also used to have a bookshelf full of books and ended up donating them all. Today I own a small folder that holds all my documents and I get all my books from the library. In fact today, I don’t own a single book and yet I love reading. As much as I love the smell and feel of paper, It’s refreshing and liberating to have only what I really need on paper. Everything else is a lot safer and more easily accessible online. I moved a whole lot within the last 4 years. I moved from Vienna to London and I moved places within London. I moved from London to New York City and I moved places within New York City. 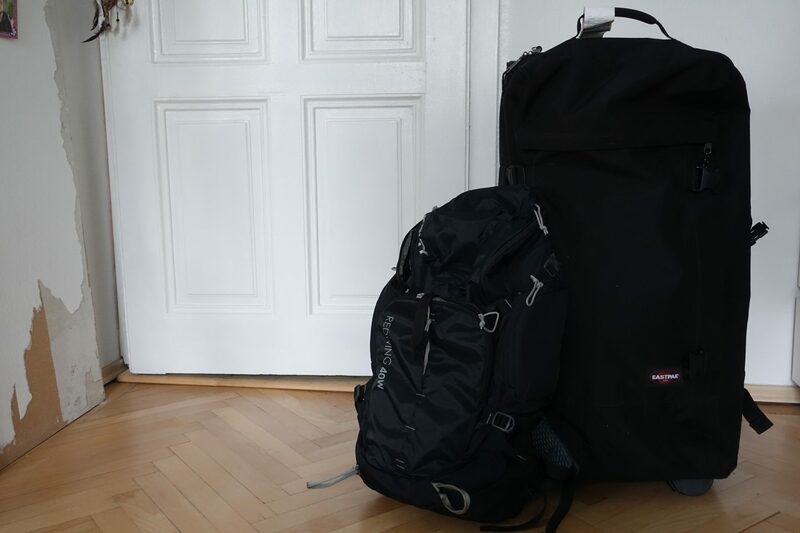 Everything that I own fits into my suitcase and carry-on and while moving places can be challenging, moving with so little stuff is an absolute breeze. I would have never imagined that I would be able to move with so little stuff. Today, I couldn’t imagine moving any other way. Living minimal and moving very mindfully has become my default. Over the years I’ve come to understand that I feel a lot better and so much more comfortable the fewer items I have. I know, weird. Knowing that everything fits into my suitcase and carry-on gives me peace of mind. I am able to focus more on what’s truly important to me and I feel at ease. Knowing that I can pack everything up and just go gives me peace of mind. While I hadn’t had a big purge since 2014 I always make it a point to go through my belongings whenever I move. I always make sure to bring only what I really need. Of course, as with everything else, needs do change and what served me in the past may not serve me in the future. What’s important to me is to really just evaluate what it is that I need right now and what I can do without. Prior to my big purge in 2014 it took me a while to get ready for a trip or move. Granted, during my childhood, I only moved two times. However, whenever I did move I brought way too much with me. Today, I can pack up everything I own within 30 minutes. I feel a greater sense of freedom. I also appreciate the items that I do have so much more. I am definitely one of those people who tend to get stressed out fairly easily. Whether it’s a change in life situation or difficulties in relationships. It doesn’t really matter what it is, I tend to stress. Having fewer things has helped me so much. I know exactly where everything is I just feel so much better. As a result of it, I am less stressed out when it comes to other areas of my life. A couple of years ago It would sometimes take me hours to hunt a particular item down. Don’t get the wrong idea, I was fairly organized, there was just way too much I didn’t really need. This made finding things that I actually needed harder then it should have been. Whenever I do have trouble finding something these days I am usually able to locate it fairly quickly. Change is truly wonderful and needs to be embraced. Growing up I definitely I definitely found myself struggling with change. Ever since I embarked on my minimalist journey I’ve grown to love and crave change. I’ve come to realize that the fewer material possessions I have, the easier I can embrace change and accept things as they are. I do like for certain things to be constant in my life however, I do really appreciate having a lot of flexibility in my life. I love the fact that I am able to pack everything I own up within less than 30 minutes. I love the fact that I can carry all my belongings, by myself. Just knowing that I am this flexible in this particular area of my life gives me a tremendous sense of ease. It has helped me greatly in reducing my stress levels. “Do you miss home?” is something that I get asked a lot and oftentimes I am a little confused. For me, home is where the heart is. Home is really wherever I go – wherever I am there is home. I would’ve never in a million years thought that this would be my life. That I’d be someone who lives out of a suitcase and backpack and loves it. This is it though, this is me and this was What I’ve learned from living out of a suitcase. I wouldn’t want to have it any other way. Living out of a suitcase and carry-on has truly been a life changing experience.